If you’ve been to the movies recently, you’ve probably heard Anne Hathaway’s emotional portrayal of Fantine in the musical “Les Miserables.” Knowing her story makes her statement understandable. Abandoned as a child, she finds herself working in a factory where she meets a man. She falls in love with him. He takes full advantage of her feelings and enters into a relationship with her. However, upon learning she is pregnant; he abandons Fantine and their child. Left without options, Fantine leaves her daughter, Cosette, with an innkeeper and his family so she can work to support the child. The innkeeper, an unscrupulous man, deceives Fantine into believing Cosette is sick to extort more money out of her for childcare. Before long, the factory manager learns of the illegitimate child and fires Fantine. Desperate to pay the mounting “bills” for her child, Fantine resorts to selling her hair, her teeth, and finally her body to save Cosette. By the time her story is known by someone who can help, her health fails and she dies before she could be reunited with Cosette. It is in the midst of this tragic story that Fantine sings “I Dreamed a Dream,” a musical soliloquy venting the anger and frustrations felt by a young woman who had been beaten down by the world at every turn. As I had previously blogged in I Dreamed a Dream, Fantine’s dreams simply weren’t enough to help her overcome her misfortune. But for me, this new recording offered a new revelation and something to which we all might relate. Every now and again we hear stories about people living out their dreams. These stories are inspirational to many people because for most of us, our dreams and our realities are in two very different places. Did the happy newlyweds ever dream they’d end up in divorce court? Did the new business owner ever plan for the day she would have to close her doors and liquidate? Did the man who felt great walking into his physical exam anticipate the cancer diagnosis that the tests would show? 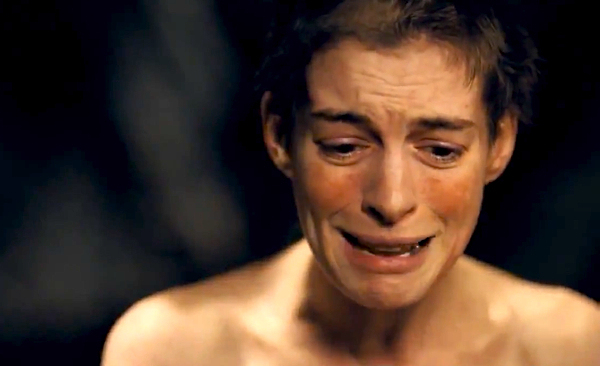 It is fair to say that for one reason or another, most of us can relate to the anger and frustration felt by Fantine in her song. But before the pity party begins, let me ask one simple question: What are you doing about it? Let me offer two thoughts in the form of a cliché in reverse; Let God and let go. Start by going to God with your troubles, trials and concerns. In prayer, we can find comfort, peace and clarity to move forward. Listen to the testimonies of others who have faced challenges both big and small. Hear how faith and trust in God led them out of darkness into a new and brighter place. Then once you know that God is with you, leading and encouraging you, step out into the newness of whatever you are called to do knowing that in Him you will not fail. Deuteronomy 28: 1-14 provides a clear reminder of all we can become when we obey the commands of the Lord. Now that you are seeking the will of God for everything in your life, you can effectively do the one thing that so many people can’t – let go. We’ve all been wronged. We’ve all had things taken away from us. We’ve all experienced dead end jobs with uninspiring leaders. We’ve all faced bills we couldn’t pay. We’ve all lost someone we love. Many of us have clung to those things like Linus to his blanket. But what peace comes from holding onto anger; what joy grows out of unforgiveness? God is showing you the path to the next thing. He has prepared the course and has promised to lead us there. Leave behind the things that Satan and the world tried to saddle you with and sprint forward in the freedom of the future God has waiting for you. Cast of the former thing – the hell you may be living and change the dream into your life in the Lord. This entry was posted in Devotional and tagged A Mile in My Schu's, Anne Hathaway, Bible, Blessings, Choices, Christian Life, Christianity, Courage, Day 1 of 1, Deuteronomy 28:1-14, Devotion, Devotional, Devotionals, devotions, Faith, Faith in Action, Fantine, God, God's Love, God's Plan, Hope, I Dreamed a Dream, I had a dream my life would be so different from this hell I'm living, Les Mis, Les Miserables, Let Go and Let God, Life, Love, Overcoming, Perseverance, Prayer, Psalm 9:9-10, Religion, Richard Schumacher, So Different. Bookmark the permalink.